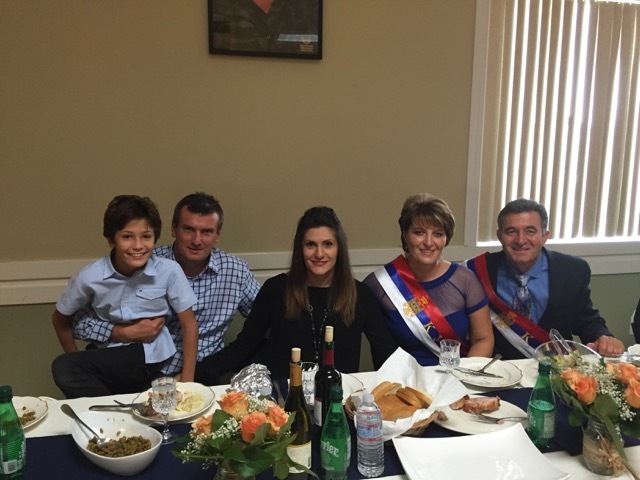 San Marcos, CA - His Grace Bishop Maxim of Western America visited the faithful of St. Petka Serbian Orthodox Church in San Marcos, California on the occasion of the celebration of their Church Slava, Sunday, October 25, 2015. 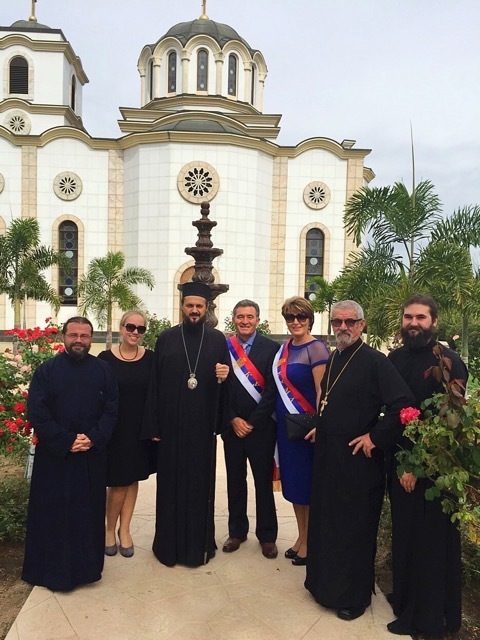 Concelebrating with His Grace at the Divine Liturgy was Protopresbyter-Stavrophor Milan Vukovic, retired priest from the San Marcos parish and Protopresbyter Milovan Katanic, the newly appointed priest. Also concelebrating were Deacon Zoran Aleksic, the diocesan deacon, and Deacon David-John Williams from Nativity of the Most Holy Theotokos parish in Orange County. In his homily His Grace, the bishop, spoke on the gospel parable of the Sower and just as there was seed which fell on good ground it is our task to diligently cultivate the ground of our hearts that the seed, the Word of God, produce much God-pleasing and salvific fruit. The Slava litiya led by the bishop and clergy ended at the entrance to the church where His Grace officiated at the Rite of the Cutting of the Slava Kolach, turning the kolach with this year's kumovi Petar and Marija Banovic and their children as well as many other parish children and faithful. There the dismissal to the liturgy was taken after which the bishop once again addressed the many faithful who had gathered to partake in the joy of the day's Slava celebration after which he distributed the antidoron. 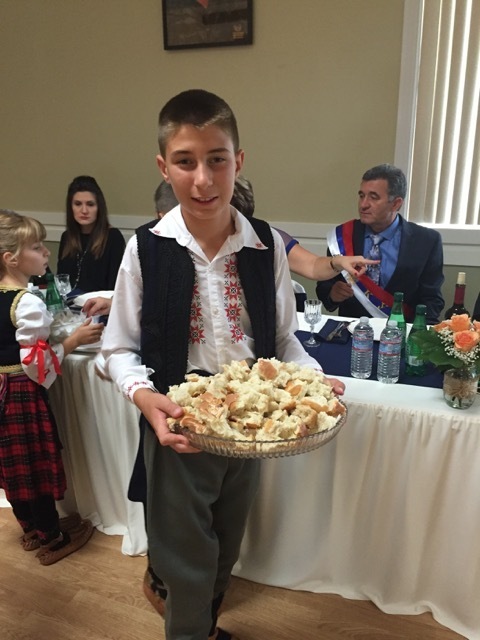 A festive Slava banquet was prepared in the spacious church hall. Fr. Milovan greeted everyone during the program wishing all a joyous Slava celebration, expressing his great joy and the joy of the entire congregation whenever we are gathered around the holy Eucharist, particularly when we are given the opportunity to celebrate it and be led in prayer by our hierarch as was the case and the joy of that day. 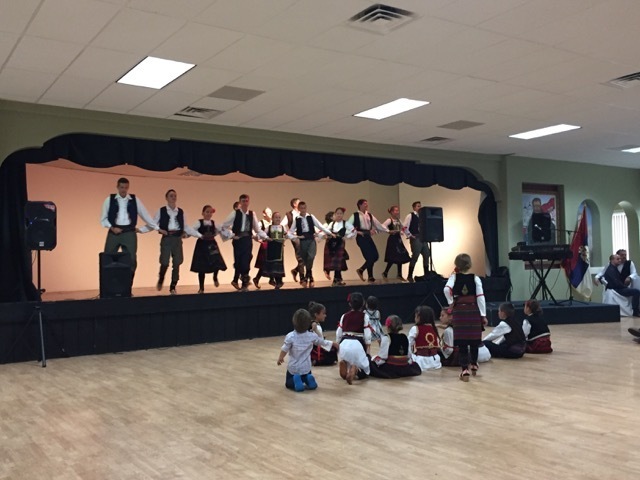 The parish folklore groups of all ages performed during the program. Slava festivities lasted until the early evening hours.